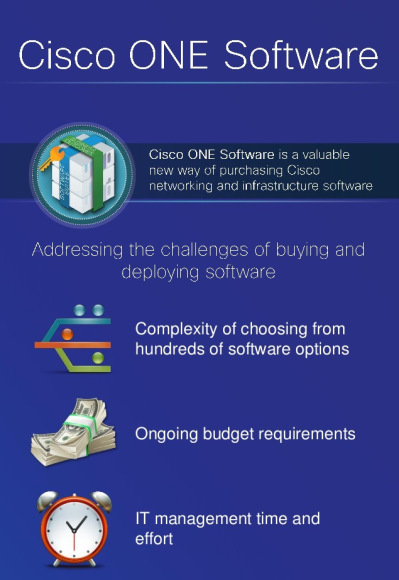 Cisco announced its Cisco ONE Software Licensing Program at Cisco Live! 2015 Event in Milan in January, 2015. The goal of the initiative is to simplify greatly the ability of customers to license Cisco software across the full range of switches, routers, wireless devices and Unified Computing Servers (UCS) the company offers. Cisco ONE provides a single license for all-in-one hardware and software package aimed at a specific networking use case, but it may be the high-priced option. The all-in-one products cover a half dozen use cases within three networking categories, the data center, the wide-area network (WAN) and wireless access. Cisco ONE for Access: It helps you manage and scale your access, aggregation, and core switches from the campus to the branch. 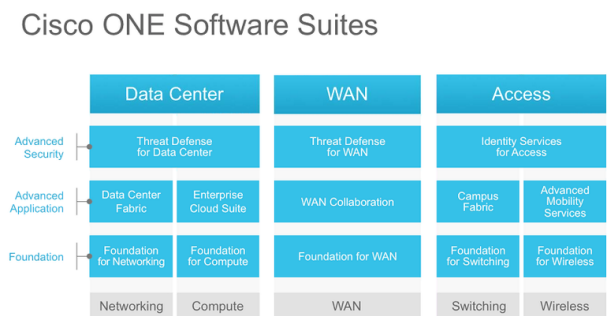 Cisco ONE for WAN: It helps manage, secure, and optimize your WAN for better business outcomes in branch offices and the network edge. Cisco ONE for Data Center: It makes it easier for you to build scalable, resilient, and highly secure, converged, multi-tenant data center networks. Under the terms and conditions specified in the Cisco ONE program, software licenses are now portable. Customers no longer have to repurchase new software whenever they upgrade hardware. Customers also have the option of purchasing perpetual licenses or opt for a subscription license option Cisco plans to roll out formally later this year. In addition, customers still have the option of signing an Enterprise License Agreement (ELA) to provide enterprise-wide access to Cisco software. Cisco ONE is comprised of three layers. The foundation tier includes core networking, security and systems software, along with network and energy management. The second layer, which Cisco calls “advanced,” includes software capabilities specific to the use case. This tier is for IT departments to build capabilities on top of the foundation layer. Finally, Cisco has built a security layer across all the domains, which is more advanced than the security built into the foundation alone.